Brother Jesse Blog: I can't live without my radio......I mean my Final Call Newspaper!! I can't live without my radio......I mean my Final Call Newspaper!! I know you remember those famous lyrics from LL Cool J but it's not my radio I can't live without. It's the weekly edition of The Final Call Newspaper I have been in love with since my high school days. I learn more from this newspaper than just about any other magazine or newspaper on the stands. That's not to say I don't read other sources, because I do. But the one thing, amongst many, that separates The Final Call Newspaper is that inside every edition is spiritual guidance from the Most Honorable Elijah Muhammad and the Honorable Minister Louis Farrakhan. Regardless of your belief, we all can bear witness that guidance is needed in this world and these are two men that should be studied more carefully by all. In this week's edition you will find more color pages inside along with extensive coverage of Saviours' Day 2010, coverage of Minister Farrakhan's Saviours' Day follow-up message delivered at Mosque Maryam on March 7, 2010, information regarding death threats received by popular radio talk-show host Warren Ballentine after he appeared at Saviours' Day, and more coverage of the SD2010 workshops and forums including "Redefining the American Gangster" with Frank Lucas and "Freeway" Rick Ross. And that's not it but you will just have to pick up a copy for yourself to see what else is inside. 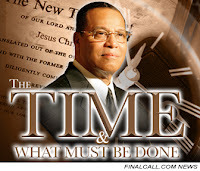 The Honorable Minister Louis Farrakhan's powerful lecture series: The Time and What Must Be Done live from the Nation of Islam's Mosque Maryam in Chicago continues on Sunday March 14, 2010. "The enemy has come after me in their newspapers and on television. I have been mocked and scorned, laughed at by the foolish, and even disbelieved by some of you who claim to be wise. I've been preaching for 54 years, and they may call me whatever they call me, but none of them call me a liar," the Honorable Minister Louis Farrakhan declared during his March 7, 2010 address to thousands on the grounds of the Nation of Islam's National Center and thousands more who watched his address live via webcast in homes and venues across the country and globe. Sunday morning's live webcast feed will be freely available to the public @ http://www.noi.org/webcast/ 10am Central Time. The Minister's subject will be "The Time and What Must Be Done; The Great War."